Trend plots, line plots, contour plots, parallel coordinates plots, etc. In addition, these charts can be layered, which means you can add multiple plots on top of each other. For example, you can make a density plot of 2 features of all the wells in an experiment, and add a scatter plot on top that highlights the experiment's high control wells. Beyond that, charts can be configured in great detail. The most important settings are described in this topic. To create a chart, the first step is to open a Chart View on a selection of data. 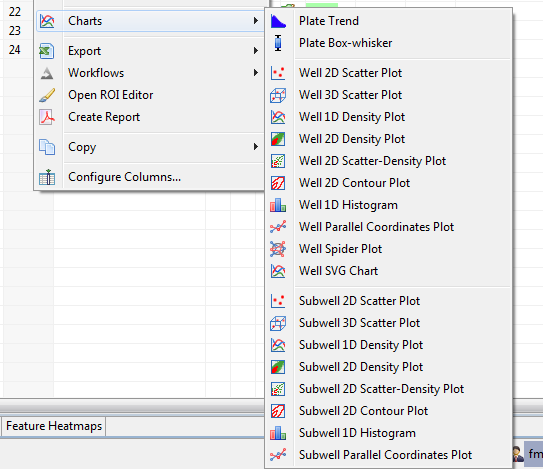 Right-click on a selection of plates or wells, and select one of the available chart types. 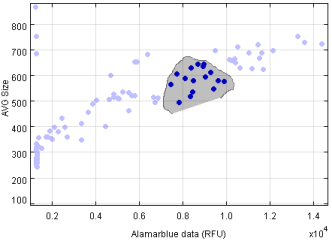 For example, to view the correlation between two well features in a plate, select the plate and open a Well 2D Scatter Plot. Each blue dot represents one well of the selected plate. To select the features that should be plotted, use the X and Y buttons in the view's toolbar. All charts are interactive, which means you can select wells in the chart by holding down the mouse button and drawing a shape around the items you want to select. If another view on the same plate is open (for example, a heatmap or another chart), the selection will be highlighted there as well. To clear a selection, simply click somewhere in the chart background. : Add another chart on top of the current chart. Use this option to create layered charts. : Select this option to hide unselected points. Normally, unselected points are semi-transparent. With this option checked, they are hidden entirely. : If you have panned or zoomed the chart, use this button to reset the view to its original states. : Select the features that will be plotted on the X/Y/Z axis. : If the protocol supports it, use this button to perform manual classification on the selected items. This action will perform well classification on well charts, and subwell classification on subwell charts. : On well charts, use this button to plot normalized values instead of raw values. : Use this button to choose between different layout arrangements of the chart panel and the legend panel (see below). Below the plot, the chart legend is displayed. This legend contains a lot of information, and allows you to change many chart settings as well. The most important settings are explained below. The legend table contains one row per chart layer, plus an additional row for the chart axes. A row can be expanded into multiple rows if that chart layer contains grouped data. For example, a well chart can be grouped by well type, in which case the legend shows one row per well type. Name: the name of the chart layer. Untick the checkbox to hide that layer. Size: the size of the items for this layer. For a scatter plot, it corresponds to point size. For line plots, it corresponds to line thickness, etc. Click on the value to change it. Transparency: the transparency of the items for this layer. Click on the value to make a layer more/less transparent. Grouping: the grouping method used for this layer. Click to choose a different grouping method. When data is grouped, each group will be rendered with a different color. Total, Selected, Visible: the number of data items on this layer. Note that applying a filter (see below) will reduce the number of visible items, not the total number of items. Selected Features: shows the features that are currently being plotted for this chart layer. Actions: a set of additional actions that can be performed on this chart layer. Chart Settings: open a dialog to set additional settings for this chart layer. X/Y/Z: specify the features that will be plotted on the X/Y/Z axis. Note: use with care. This option allows you to plot different features on different chart layers, but the result may be confusing for viewers. To specify the features for all layers at once, use the X/Y/Z buttons on the toolbar instead (see previous topic). Filter: apply a filter on this chart layer. Data items that do not match the filter will be removed from the view. 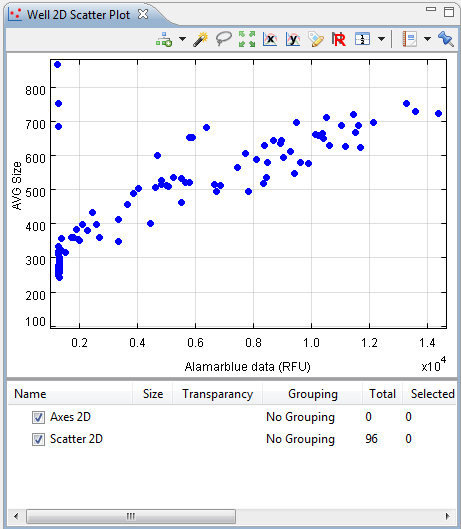 Aggregation: aggregate groups of data to plot a reduced number of aggregated values. Note: use with care. This is only useful in specific situations, such as timelapse plots of subwell data. Color axes: represent up to 3 additional features by coloring the data items using one of the available coloring schemas. Reset layer: reset all options on this chart layer. Remove layer: remove this chart layer from the view.